The Lotus Hill, also known as Lianhua Mountain, in Guangzhou is the right place to enjoy the beauty of blooming lotus flowers. The hill is situated near the Pearl River Delta, and is another of the well known natural attractions of the city. In fact, this river delta is also known to be the location of several other hills. The hill is outside of Panyu City, and its distance from Guangzhou is about 20 kilometers. There are about 48 quarries in this Lotus Hill region and together, they take up about 2.54 square kilometers. All these hills are quite low in height and are made of red stone. Apart from its link with the flower, the name Lotus Hill also refers to a fairy tale. According to the story, a dragon, which lived in the South China Sea, used to create tidal waves to sink ships and flood the farmlands near the Pearl River. The ordeal of the local people moved the Goddess of Mercy and she threw her lotus seat and overpowered the dragon. People believe that it is this lotus seat that later transformed into the Lotus Stone, thus giving the hill its name. This is the very reason why you will find a gold statue of the deity on this hill. The statue of the Goddess of Mercy is also considered to be the biggest statue in the world. It was built in 1994 and has 180 gold teals and bronze that weigh 120 tons. Apart from this, the area also has some stone quarries that are about 2000 years old. The authorities have preserved these mines with enough care and they have now become an important part of the Lotus Hill in Guangzhou. The mining area was a part of the Lotus City, which was built by Kangxi of Qing Dynasty. The dynasty ruled over the country from 1644 to 1911. But if you take a closer look at the quarries, you will see that they stand testimony to not only the era of the Qing Dynasty, but also several other dynasties including the Western Han. These quarries are made of red stones and have grottoes and stone forests. They also have different name like Lion Stone, Eagle Cliff, Swallow Rock, and Goddess of Mercy Rock. These cliffs provide different views to the tourists. If you stand on Eagle Cliff, you will see the beautiful Pearl River beneath and get a view of the fertile farmlands. Swallow Rock, on the other hand, may be too much for the faint hearted, as it provides a great view where the sky seems to be engulfed by the four cliffs encircling the rock. That is why the rock has got such a name. The Lion Stone is a replica of a stone lion that seems to be roaring, facing the Pearl River. 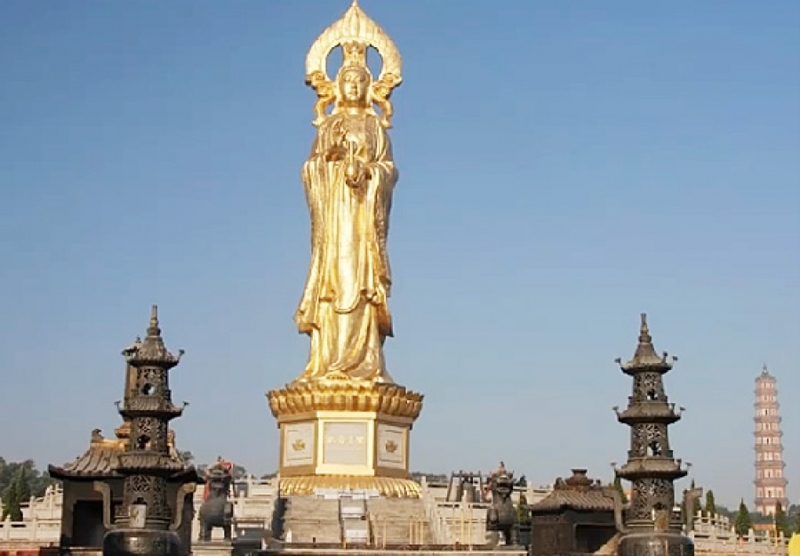 The presence of this statue has also given this attraction in Guangzhou its second name - the "Lion Hill". On this hill, you will find the Lotus Tower that dates back to the Ming Dynasty. It was built by emperor Wan Li, who wanted to celebrate his 40th year of ruling. The tower is also famous by the name of "Capital's Cloud Pillar", stressing the fact that Guangzhou is the capital of the Guangdong province. Visit Lianhua Mountain in Guangzhou anytime between June and August. That is the time of Lotus Flower blooming and Peach Blossom Festivals. Let your tour be a memorable one.